Summer is my favorite season because summer means f r u i t and lots of it. Strawberries, in particular, are beautiful and delectable and are clearly begging to be baked in a pie. One morning a few weeks ago I decided to make that happen. It was either that or write a paper, and as you can imagine I have my priorities in line. 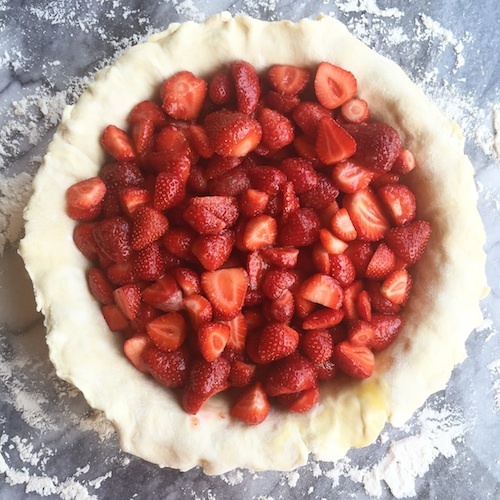 Come to find out, strawberries on their own make for a super juicy pie. Like, splashing all over the sides and onto the floor (and you) when you remove it from the oven kind of juicy. I probably should have figured as much, given that strawberries are usually paired with apples or rhubarb in pie–turns out those pairings serve a scientific purpose in addition to complementing the flavor and texture of the strawberries. I wasn’t thinking about science that morning. I had a paper to not write and an overwhelming number of perfectly ripe strawberries and I wanted a real simple strawberry pie in my life. Runny pies that don’t set up are the stuff bakers’ nightmares are made of. In desperation, I ended up draining some of the excess juice by tipping the whole dish gently over the sink. As it happens, lattice tops are more than just a pretty face; they make for great drainage as well. As fun as it is to spill bright red liquid all over yourself when you’re running out the door because you’re late for a dinner party (and freak out your roommate because it looks like you’ve just bled out a pint all over the kitchen), I think the next time I opt for a pure strawberry pie I’ll first cook the berries down a little bit, either on the stove or in the oven, to release some of the water. Luckily I do have one remaining graduate school assignment requiring some procrastination, so I may just get to the experiment sooner rather than later. Preheat oven to 400°F, and place a baking sheet onto the center rack of your oven. 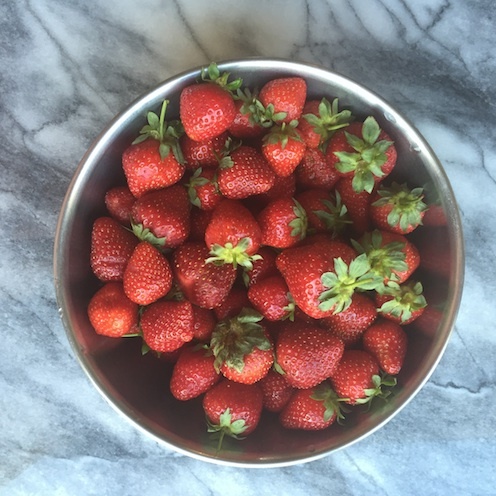 In a medium bowl, gently toss together the strawberries, sugars, cornstarch, salt, lemon juice, and ground ginger. Toss until all of the cornstarch has disappeared into the strawberries and let rest for 10 minutes. The strawberries will begin to produce juice. On a well-floured surface, roll the bottom crust to about 1/8″ thick and about 12″ in diameter. Transfer it to a pie pan. Trim the edge so that about a half inch hangs over the edge of the pan. Brush some of the beaten egg on the bottom and sides of the lined pie dish. Spoon filling into pie crust. Roll out the top crust. 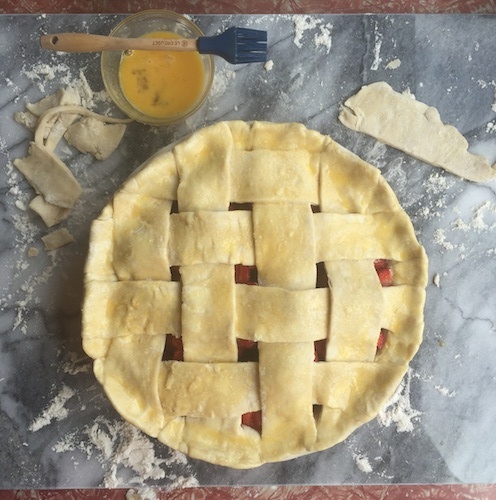 Slice the dough into 1-inch wide strips and weave the crust strips on top of the pie. Handy tip on lattice-making here. Brush more of the beaten egg over the top of the pie crust, then sprinkle liberally with sugar. Place pie in the oven on the baking sheet and bake for 15 minutes, then reduce the temperature to 350°F and bake for about 30 minutes more, or until the crust is golden and the filling is bubbling. Remove from the oven and allow to cool completely before serving. Pro tip: if your berries are as juicy as mine, you may want to gently tip the pie over the sink and drain some of the liquid, lest it splash all over you while you are rushing out the door while heading to dinner at a friend’s place. 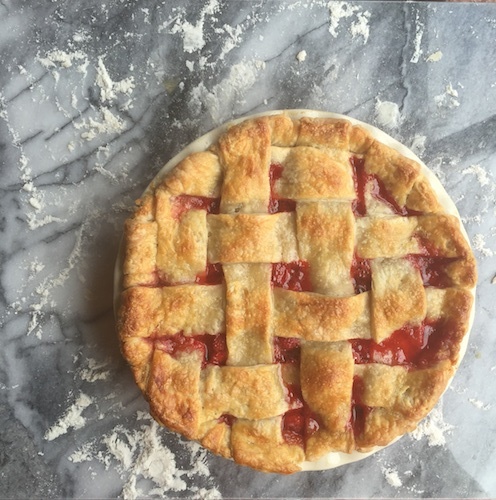 This entry was posted in Pie and tagged strawberry pie. Bookmark the permalink.